Doctors are working with an organization in Bangladesh to help deliver mental health care to Rohingya refugees from Myanmar. 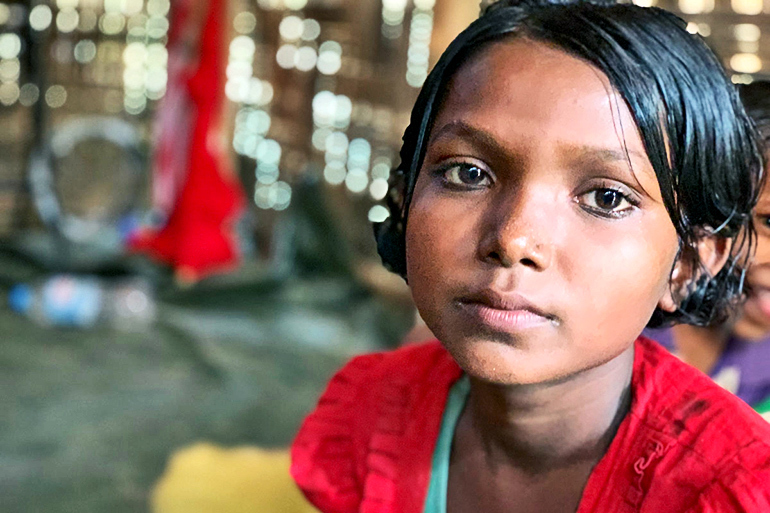 Since 2017, more than 740,000 refugees—more than half of them children—have fled violence in Myanmar and settled in overcrowded camps in Bangladesh. In one camp, a 12-year-old Rohingya boy flatly, stoically tells of how, within three hours one day in August 2017, the Myanmar military murdered 56 members of his family in their village in western Myanmar. Of his immediate family, his parents and three sisters were slain; only he and his brothers—ages 27, 25, and 10—survived. A mother weeps as she describes how she and her 10-year-old daughter escaped to Bangladesh after their heads were sliced open with machetes, the woman was raped and their home set ablaze. Her husband and their three other children, ages 4, 2, and 1, were killed—the baby, as she held him. A middle-aged man with torturous memories rants unintelligibly about the soldiers who raided his village. He frantically acts out the violence he witnessed, firing a gun no one else can see, but that he can’t stop seeing. 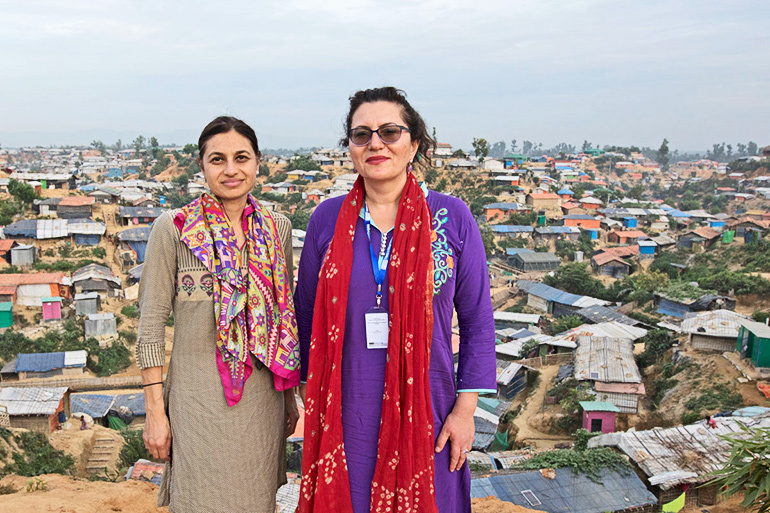 What happened in Myanmar to these and thousands of other Rohingya refugees, and how their experiences and losses forever changed their lives, are the reasons Rupa Patel and Anne Glowinski travel to the refugee camps in southeastern Bangladesh. While numerous aid organizations focus on the refugees’ basic needs, Patel and Glowinski, colleagues at Washington University School of Medicine in St. Louis, have zeroed in on another crisis: the profound need for mental health care, and the dearth of people and means to provide it. More than 900,000 Rohingya—mostly Muslim but some Hindu—live in small bamboo huts in sprawling, overcrowded camps not far from the Bangladesh-Myanmar border. More than 740,000 of them arrived in quick, desperate waves after Aug. 25, 2017, the beginning of a savage campaign that United Nations (UN) investigators say showed evidence of the gravest crimes under international law, including genocide. Patel, an assistant professor of medicine and a public health specialist, responded to a request from a Bangladeshi nongovernmental organization (NGO) that needed help mapping out and delivering health care and other services for the unprecedented surge of refugees. With support from the Global Health Center of the Institute for Public Health, she jumped in, advising the NGO on sanitation, medication, and other pressing issues—but quickly realized the necessity of helping address the traumatized refugees’ fragile mental health. She enlisted Glowinski, a professor of psychiatry and associate director of Washington University’s Division of Child and Adolescent Psychiatry, to help figure out how. Troubled by the horrendous accounts she was hearing, Patel also volunteered to become a forensic investigator with the organization Physicians for Human Rights, to help document crimes against the refugees. She has since begun collaborating with Leila Sadat, director of the Whitney R. Harris World Law Institute at Washington University School of Law, to work toward finding justice for the Rohingya. The ruthless campaign against the Rohingya left an estimated 10,000 dead, and their villages looted and torched. The attackers burned villagers to death in their homes, gunned them down as they fled, or beat or stabbed them to death. They gang-raped and disfigured women, and tossed their babies into fires and rivers. A UN Human Rights Council fact-finding panel found patterns of violations committed principally by Myanmar’s security forces. While Myanmar denies its military was behind the brutality, saying it only responded to Rohingya insurgents who had attacked police checkpoints, the UN panel wants Myanmar’s army commander and other generals to face trial for genocide and crimes against humanity. The ICC’s prosecutor is reviewing allegations to determine how to proceed. Patel feels strongly that those who committed acts of violence against the Rohingya must be held accountable and that they must make reparations, including land and a safe return to Myanmar. She was a member of a team of doctors that, as part of a Physicians for Human Rights investigation, examined and interviewed Rohingya Muslims who had survived a massacre in the Myanmar village of Chut Pyin. A report based on the group’s findings focuses on how the attacks unfolded, offering details consistent with reports of assaults on other Rohingya villages. The organization created the report in hopes it would help bring the aggressors to justice. In Patel’s collaboration with Sadat—who is a professor of International Criminal Law and a special adviser on crimes against humanity to the International Criminal Court’s prosecutor—the two have discussed potential options for justice for the Rohingya, as well as what sort of evidence the ICC would require as part of an investigation. Their discussions resulted in Patel traveling in December to the Hague, in the Netherlands, for meetings focused on working with victims in crisis situations. She traveled there again in February for training focused on investigating sexual and gender-based violence. The effort, which the Institute for International Criminal Investigations oversaw, aims to build a network of people with skills to investigate—and train others to investigate—sexual violence as a violation of international criminal law. The Rohingya Muslims have faced repression for decades in Myanmar, a majority Buddhist nation formerly known as Burma. Though the Rohingya have lived for generations in Myanmar, they are viewed as unwelcome immigrants. In 1982, the government stripped them of citizenship. They are not allowed to attend government schools, vote, or move about freely, among other restrictions. Bangladesh has opened its borders to fleeing Rohingya before, but never this many, and never so many this traumatized. She and Patel realize the immensity of the problem and their limitations, however, so they work with the Bangladeshi NGO that contacted Patel in 2017, when the deluge of refugees began streaming into the South Asian country. The organization, called Friends in Village Development Bangladesh (FIVDB), now relies on Patel as its senior health adviser. One of Patel’s strengths is finding existing resources and programs—for example, health- and shelter-related outreach efforts that FIVDB and other organizations previously initiated—and building onto them, rather than starting from scratch. The chief role for Glowinski—FIVDB’s mental health and education adviser—meanwhile, is training the NGO’s employees and volunteers how to screen for and respond to mental health concerns in a setting where everyone is dealing with losses, stressors and great uncertainty. No one knows what is to come for the stateless Rohingya. They likely will live in the teeming refugee camps for years, or even decades. Knowing that and knowing the atrocities the Rohingya have suffered, mental health care is critical, Glowinski says. With so many refugees and so few resources, there will never be enough people to help address mental health in the camps. But even recognition within the Rohingya population that mental health is a key component of one’s overall health and that it shouldn’t be overlooked will go a long way. 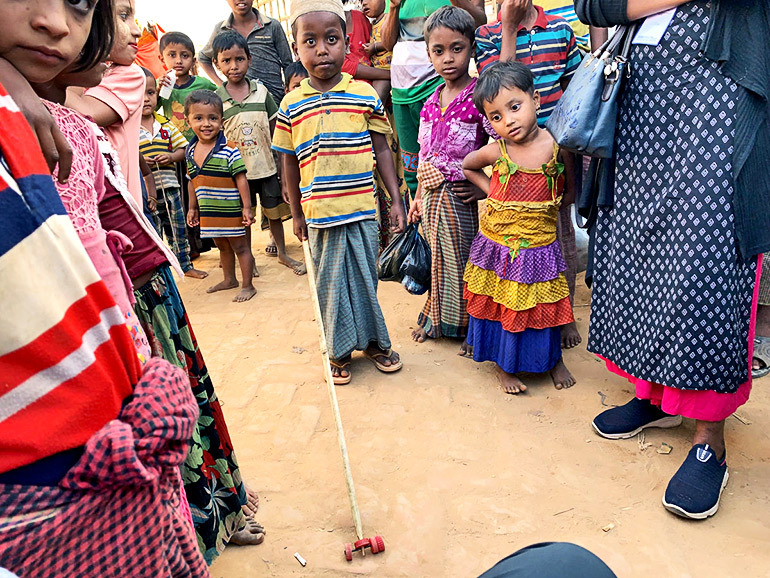 When Glowinski and Patel visit the camps, they meet with refugees to learn how they are coping, what they need, and how they can best help them. One theme comes through repeatedly. “They killed my people, and we will never get them back—but we want justice,” the 12-year-old boy who lost 56 members of his family told Glowinski and Patel through an interpreter during their recent visit to the camps. The boy does not have the look of a young adolescent. His wears a serious expression, and his eyes lack joy. He’s witnessed far more tragedy than any child ever should. As she does with everyone she talks with in the camps, Glowinski thanks him for sharing his family’s story and his thoughts. “The Rohingya are going to continue to be ping-ponged back and forth from one nation to another, and they will remain stateless for a while, which will eat at their psyche, their dignity, their self-worth,” Patel says.